Thread: What are you reading ? Every so often I like to ask my friends what are they reading. This kind of discussion breaks us out of our bubbles and introduces us to new ideas , and that is always a good thing. I am currently reading a book by Tara Westover called Educated. Just about to finish it. An autobiography. She had not set a foot in a classroom until she was 17 years old. When taking the ACT to attend Brigham Young University, she was unaware as to what “ the bubbles” on the test meant. She was baffled when the classroom went silent after she raised her hand to ask what the Holocust was. Tara grew in rural Idaho along with a repressed mother, a violently abusive brother and an extremist, bipolar father who believed the end of the war was near. Totally isolated from mainstream society, her family did not believe in the medical establishment nor in public schools, convinced they were all a part of a government conspiracy. Accidents causing serious injuries to the family were seen as acts of God , not as wretchedness on her father’s part. Loyal and obedient with no exposure whatsoever to the outside world , Tara was devoted to her parents, never questioning their beliefs. That is, until one of her brothers got into college bringing home bits of knowledge from the world she was being denied. Tara taught herself algebra, grammar and science and was accepted in BYU. Her world opened up in such a way that she felt she was committing treachery against her family. Torn between her love for them and her own sense of belonging , Tara faces the decision whether to return home or become estranged from her family. So, what are you reading ? And willing to share ? Re: What are you reading ? I read (in the past tense) Tony Hillerman's Navajo cop series. He seemed to write one in every few years and I'd ask a friend in the US to buy and send it to me. It was before Amazon and the Internet. His works are well written in my opinion and the plots are tight (you know what I mean). They are also educational, because Hillerman always throws in Native American cultural stuff. I like mysteries but I don't like demonically inspired ones. Nowadays I don't read much, because I don't know good writers, in English speaking countries or Japan. I know a guy who boasts about the amount of books he has read, but readying crappy books isn't much better than watching crappy TV. I just checked out this from my local library and haven't really got into it yet, but what I've read so far is pretty hilarious. Such an enigmatic and divisive figure demands a reckoning that is far from the usual fare. 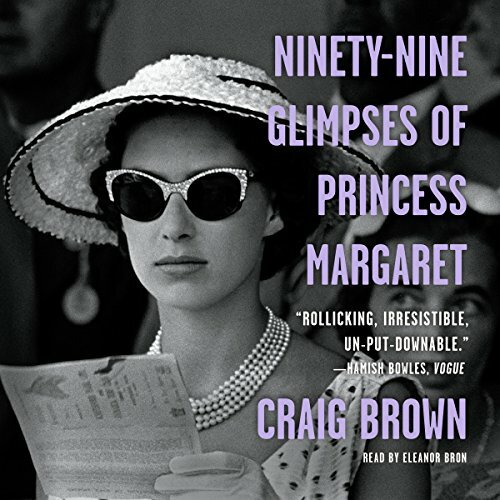 Combining interviews, parodies, dreams, parallel lives, diaries, announcements, lists, catalogues, and essays, Craig Brown’s Ninety-Nine Glimpses of Princess Margaret is a kaleidoscopic experiment in biography and a witty meditation on fame and art, snobbery and deference, bohemia and high society." I am reading Who Am I? Why Am I Here?, by Patricia Cota Robles. She has pretty much dedicated her life to education about humanity’s purpose in the Universe. I have followed her for several years, including seeing her in person, and really appreciate her perspective. It would have to be considered channeled work. I highly recommend her. "Each one of us has within us the potential to be a Master. Learn the secrets of the field you have chosen, submit to a rigorous apprenticeship, absorb the hidden knowledge possessed by those with years of experience, surge past competitors to surpass them in brilliance, and explode established patterns from within. Study the behaviors of Albert Einstein, Charles Darwin, Leonardo da Vinci and the nine contemporary Masters interviewed for this book." That came to my attention because of a Facebook post from a group I belong to that is celebrating the upcoming 20th anniversary of a treesit demonstration I was part of when I lived in Fayetteville, Arkansas in 2000. A friend of mine, a grandmother who had named herself Mary Lightheart, climbed up in a grandmother oak tree that was going to be cut down (one of many in a grove of similar trees) so that two new department stores could be erected. She did it on an impulse one day at a demonstration of activists who were protesting the plan, but once up there, she said she wouldn't come down if the group of activists would support her, which we decided to do. And before the authorities had time to organize their tactics, some guys had gone to the site and put a platform up in the tree, provided Mary with a tent,clothing and other necessities, and we had organized volunteers to go regularly to bring supplies, etc. Mary stayed up there for 3 harrowing weeks. I volunteered to go out to the site the final night when one of the guys was going to replace Mary, who had had enough by that time. The authorities had been pretty hands-off up until then, mostly because Mary was a sweetheart and an older woman and they didn't want to create too much bad press, but they were beginning to make threats that they were going to go up into the tree and force her down. So a few guys with infra-red lights mounted on their hats (so we wouldn't be detected) and another woman and I all went out there in the wee hours and brought Mary down, and put the new treesitter up there, all on the sly so that the guards didn't know we were there ( it was quite exciting and we felt very clever for fooling them, undetected with our infrared lights). But of course when the authorities realized the next day what we had done, the s--t really hit the fan and they wasted no time in forcing the new guy down and then proceeding to cut down almost the whole the grove of trees. "Mary Lightheart, a 53-year-old grandmother, was arrested on this day for trespassing at CMN Business Park II in northern Fayetteville. Lightheart had spent three weeks living in an oak tree at the site to protest a decision by the city planning commission to allow most of the ancient oaks at the site to be cut down for construction of a Target and a Kohl's department store. More than a dozen other Fayetteville residents were arrested for trespassing over the course of the three weeks while trying to take food or medicine to Lightheart." This was around the time that activists were treesitting in Oregon to save the Redwoods and Sequoias. Julia Butterfly Hill, probably the most famous of the Oregon treesitters, came to the Univ of Arkansas in Fayetteville to honor Mary and give a speech about conservation, so we all got to meet her, and that was pretty cool. And it's especially interesting to me that this new book by Richard Powers apparently touches on the subject of trees being far more intelligent and essential to our survival than we give them credit for. ...in which a channeler who is also a geologist, sacred tour guide and conference facilitator relays a message about certain kinds of trees including Sequoias, Redwoods and Oaks, which he asserts are actually sentient. Last edited by onawah; 7th April 2019 at 05:34. "The Cruel Sea is a 1951 novel by Nicholas Monsarrat. It follows the lives of a group of Royal Navy sailors fighting the Battle of the Atlantic during the Second World War. It contains seven chapters, each describing a year during the war." I usually don't read fiction books like this but wanted to mix it up. I'm liking it so far. My current read is The Dolphin's Boy by Pascale Noa Bercovitch. It's the true story of a Bedouin boy who lost his hearing after falling from a tree and who subsequently became a loner but also an accomplished swimmer (unusual for a Bedouin). A female dolphin, who had lost her family and friends befriends him and through this remarkable relationship which brings such joy and happiness to them both, he regains his hearing and subsequently his speech. I am learning so much about the intelligence, compassion, sensitivity and wisdom of dolphins and Bedouin culture. On my bucket list now: swimming with dolphins! Thank you onawah for those threads about trees I will read them later on. i do remember reading about Julia B Hill when it was happening. Small world. I recently finished the Divine Garden series books by John Panella. I would highly recommend these books to everyone here. Now I’m halfway through Poker without cards by Ben Mack. His father died when Marcus was three. At age fifteen, he was adopted by his aunt's husband, the future Emperor Antoninus Pius, putting him in the line of succession. At forty, he became a reluctant emperor of the Roman Empire. Marcus was conflicted because the demands of being emperor--on top of the temptations of wealth and power--seemed incompatible with his true ambition: to be a humble student of philosophy. Over time, though, he worked out a practical philosophy that kept him grounded amidst the stresses and excesses of palace life. That's why his philosophy is so relevant to us today, in the modern world. How did he fare as emperor? During his twenty years of service, Marcus earned the love of the people and the loyalty of the senate. Later historians called him "the last of the five good emperors." In spare moments, Marcus wrote the journal entries collected in The Meditations. They were not intended for publication, but to remind Marcus himself of his principles and priorities. As a result, they are intimate, direct, and extremely useful. Last edited by ChristianSky; 7th April 2019 at 20:14. CristianSky. Read Meditations in college decades ago. Looking right now for my copy, it should be somewhere since I never throw any good book Away. This book should be required reading in school or college. The private thoughts of the worlds most powerful man at the time giving himself advice on how to make good on the responsibilities and obligations of his position. Every night he practiced a series of spiritual excercises designed to make him humble , generous , patient, emphatic , strong , to be able to deal with whatever he was facing at the moment. Thank you for reminding me of this book. I'm juggling two books on Chartres Cathedral. The stained glass at Chartres is some of the finest ever prouduced. Writers proclaim the reds and blues of Chartres over and over. There are many outstanding windows there. The glass is approx 1 inch thick. In early gothic the reds and blues created an ethereal violet/purple with an overtone of dark red inside the cathedral. Remarkable building. Remarkable site. And a remarkable number of original windows still there. Outside the Circles of Time - Kenneth Grant. I am having a smorgasbord. It is a wild and outrageous tale that goes on and on and you start shaking your head at these characters, but they never fail to amuse and confound you. A young husband abandons his wife and child and goes on an odyssey to recapture some meaning in his life--too soon to tell how this one will play out. Fascinating study about how our body with muscular holding patterns plays in concert with our minds and keeps us in set patterns of behavior. Many holistic therapies were derived from Reich's work, but none as powerful as his for freeing the individual to experience life more fully. Last edited by frankstien; 8th April 2019 at 01:34. Frankstein...... thank you for showing me a word in english I had never heard before ! English being my second language I had to go to the dictionary to find out what SMORGABORD meant ! Don Quijote requiered reading in spanish speaking schools ! Sancho Panza and Dulcinea del Toboso who can forget ! This book should be required reading in school or college. Rosemarie, I wholeheartedly agree. What a truly masterful and inspirational book. I find myself saving many of his quotes for later use . Having just read, "The Five Dialogues" by Plato, this was the perfect follow up. Biology of Belief, Dr. Bruce Lipton. My Big Toe (Theory of Everything), Thomas Campbell. Both truly fascinating. Re-reading The Pillars of the Earth, Ken Follett - THE best novel ever! Don Quixote required reading in Spanish speaking schools ! Sancho Panza and Dulcinea del Toboso who can forget ! Smörgåsbord is a type of Scandinavian meal, originating in Sweden, served buffet-style with multiple hot and cold dishes of various foods on a table. Don Quixote continues to amaze me. Interesting item I read: Miguel de Cervantes and Shakespeare died on the same day! Many regard Don Quixote as one of the single greatest literary achievements next to the Bard's famous plays and sonnets.